All classes of cattle a similar trade to last week at Thursday’s sales with light weight bullocks selling from 210 to 242ppk for a Charolais 388kg at £940, medium weights selling from 200-226ppk for a Limousin 430kg at £970, heavy lots selling from 190 to 216ppk for a Limousin 510kg at £1,100 and selling up to at £1,420 per head. Omagh producer Charolais 388kg at £940, Charolais 410kg at £915, Charolais 404kg at £900, Charolais 430kg at £950, Trillick producer Limousin 366kg at £880, Limousin 428kg at £950, Charolais 426kg at £945, Limousin 510kg at £1,100, 508kg at £1,065, Kinawley producer Limousin 430kg at £970, Omagh producer Charolais 410kg at £915, Charolais 404kg at £900, Charolais 430kg at £950, Enniskillen producer Charolais 540kg at £1,145, Charolais 614kg at £1,260, Charolais 546kg at £1,120 and Boho producer Charolais 534kg at £1,120. In the weanling ring steers and bulls sold from £600 to £940 paid for a 400kg Charolais while heifers ranged from £500 to £905 for a 390kg Charolais. Enniskillen producer 390kg Charolais heifer at £9005, 340kg Charolais heifer at £820, 365kg AA heifer at £840, 390kg Charolais heifer at £890, 400 Charolais bull at £940, 282kg Charolais heifer at £750, 315kg Charolais heifer at £730, Kesh producer 263kg Charolais heifer at £700, 323kg Charolais bull at £800, 241kg Charolais bull at £675, 260kg Charolais heifer at £625, Derrygonnelly producer 321kg Charolais heifer at £740, 380kg Charolais steer at £910, 21kg Charolais heifer at £755, 317kg Limousin heifer at £700, Letterbreen producer 340kg Limousin heifer at £700, 400kg Limousin bull at £900, 315kg Limousin bull at £770, 322kg Limousin bull at £815, 213kg Charolais heifer at £525, 355kg Charolais bull at £840, 310kg Charolais bull at £800, 308kg Charolais bull at £830, 250kg Charolais heifer at £660, Garrison producer 370kg Charolais bull at £825, 322kg Charolais bull at £800, 374kg Limousin bull at £820, Fivemiletown producer 302kg Charolais heifer at £750, 300kg Charolais heifer at £755, 305kg Charolais steer at £830, 304kg Limousin heifer at £830, Derrylin producer 330kg Charolais bull at £850, 285kg Limousin bull at £760, 345kg Limousin heifer at £740, Monea producer 400kg Charolais steer at £875, 400kg Simmental steer at £845, 425kg Simmental steer at £845 and Trillick producer 390kg Charolais steer at £920, 390kg Charolais steer at £890, 219kg Charolais bull at £670. Drumcose producer Hereford heifer at £355, Hereford bull at £310, Letterbreen producer BB bull at £325, Aberdeen Angus bull at £275, Florencecourt producer Charolais bull at £315, Fivemiletown producer Aberdeen Angus bull at £295, Aberdeen Angus bull at £275, Tamlaght producer Belgian Blue heifer at £275, Belgian Blue heifer at £265, Ballinamallard producer Aberdeen Angus bull at £265 and Trillick producer Friesian bull at £125. Tamlaght producer Hereford cow with heifer at £1,580, Hereford cow with heifer at £1,260, Derrylin producer Saler cow with heifer at £1,240, Tempo producer Simmental cow with heifer at £1,180, Belgian Blue cow with bull at £1,100, Enniksillen producer Charolais cow with bull at £1,100, springing Charolais cow at £1,050, Brokeborough producer springing Shorthorn heifer at £1,420 and Clogher springing Hereford cow at £960, springing Hereford cow at £920. 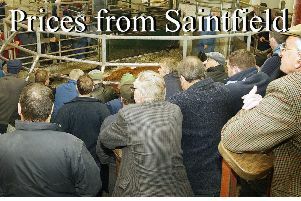 Forward lots sold to 213ppk paid for a 580kg Charolais at £1,235. Light weights sold from 195-223ppk paid for a 530kg Limousin at £180. Newtownbutler producer Charolais 580kg at £1,200, Charolais 600kg at £1,230, Charolais 540kg at £1,140, Letterbreen producer Charolais 540kg at £1,085, Macken producer Charolais 520kg at £1,050, Charolais 485kg at £1,000, Charolais 450kg at £925.